I'm excited to get to share my Babywise Success Story on Valerie's blog today. You can read it here or hop on over to her blog to read my story along with many others. After 3 weeks of newborn insanity, I grabbed on to the only thing I could still hear clearly in my mind - a friend recommending Babywise to me. I only have one kid right now (20 months), so I don't have a ridiculous amount of experience. But I will say, the newborn phase was unbelievably hard for me. I was shocked by what sleep deprivation did to me and I was a bit caught off-guard when PPD hit. But around 7-8 weeks, my little guy was sleeping 7-8 hours. It was not only a great thing for my baby, but it was a game changer for me and my outlook. Babywise was working for us and I don't know what I would've done without it. But following and implementing the principles of Babywise is no easy task. Keeping my son awake for full feedings in the sleepy newborn days, waking him up from naps when I wished so badly I could just let him sleep, establishing a consistent morning waketime, and implementing "cry it out" when necessary are just a few of the things I found to be tricky. It's tough to keep at it and not give in to what may seem easier in the moment. But all of the hard work has paid off immensely. My son is a great sleeper. He sleeps 12-14 hours at night and takes a good 2-3 hour nap each day. He instantly falls asleep on his own and just enjoys sleep in general. When we put him in his crib, he smiles and giggles. Whether it's eating, sleeping, or playing, he knows exactly what to expect each day. In the first few pages of reading Babywise, you'll find that routine (eat/wake/sleep) is number one on the priority list. A schedule comes second. This is what makes Babywise so great to me. You end up with a predictable routine that produces a predictable schedule. And whenever that schedule needs to be adjusted or whenever baby decides to adjust it on his own, you can always fall back on the routine. This allows for so much flexibility and, for us, we've seen that Babywise works in any situation we find ourselves in. Just like any other parenting book, you keep what works for you and throw out what doesn't. 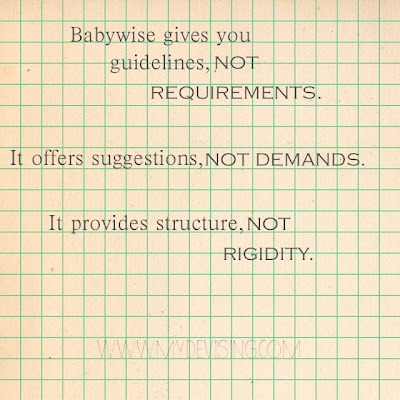 Babywise gives you guidelines, not requirements. It offers suggestions, not demands. It provides structure, not rigidity. When asked, I always suggest Babywise as a tool for moms. We are seeing benefit after benefit in our 20 month old and I certainly plan on using it with any future children. I stumbled on your blog today. I have three children, and successfully used Babywise for sleep training with all three. I don't do well with sleep deprivation, so it was a lifesaver for me. My youngest is 2, and family members are so surprised when naptime comes and I put her in her crib, and she simply goes to sleep. Keep up the good work!